For the band, see Celtic Cross (band). Ringed crosses similar to older Continental forms appeared in Ireland and Scotland in incised stone slab artwork and artifacts like the Ardagh chalice. However, the shape achieved its greatest popularity by its use in the monumental stone high crosses, a distinctive and widespread form of Insular art. These monuments, which first appeared in the 9th century, usually (though not always) take the form of a ringed cross on a stepped or pyramidal base. The form has obvious structural advantages, reducing the length of unsupported side arms. There are a number of theories as to its origin in Ireland and Britain. Some scholars consider the ring a holdover from earlier wooden crosses, which may have required struts to support the crossarm. Others have seen it as deriving from indigenous Bronze Age art featuring a wheel or disc around a head, or from early Coptic crosses based on the ankh. However, Michael W. Herren, Shirley Ann Brown, and others believe it originates in earlier ringed crosses in Christian art. Crosses with a ring representing the celestial sphere developed from the writings of the Church Fathers. The "cosmological cross" is an important motif in Coelius Sedulius's poem Carmen Paschale, known in Ireland by the 7th century. It is not clear where the first high crosses originated. The first examples date to about the 9th century and occur in two groups: at Ahenny in Ireland, and at Iona, an Irish monastery off the Scottish coast. The Ahenny group is generally earlier. However, it is possible that St. Johns Cross at Iona was the first high cross; Iona's influence as a center of pilgrimage may have led this cross to inspire the Ahenny group as well as other ringed crosses in Pictish stones. A variety of crosses bear inscriptions in ogham, an early medieval Irish alphabet. Standing crosses in Ireland and areas under Irish influence tend to be shorter and more massive than their Anglo-Saxon equivalents, which have mostly lost their headpieces. Irish examples with a head in cross form include the Cross of Kells, Ardboe High Cross, the crosses at Monasterboice, the Cross of the Scriptures, Clonmacnoise and those in Scotland at Iona and the Kildalton Cross, which may be the earliest to survive in good condition. Surviving, free-standing crosses are in Cornwall, including St Piran's cross at Perranporth, and Wales. 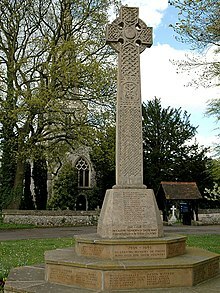 Other stone crosses are found in the former Northumbria and Scotland, and further south in England, where they merge with the similar Anglo-Saxon cross making tradition, in the Ruthwell Cross for example. Most examples in Britain were destroyed during the Protestant Reformation. By about A.D. 1200 the initial wave of cross building came to an end in Ireland. The Celtic Revival of the mid-19th century led to an increased use and creation of Celtic crosses in Ireland. In 1853, casts of several historical high crosses were exhibited at the Dublin Industrial Exhibition. In 1857, Henry O'Neill published Illustrations of the Most Interesting of the Sculptured Crosses of Ancient Ireland. These two events stimulated interest in the Celtic cross as a symbol for a renewed sense of heritage within Ireland. New versions of the high cross were designed for fashionable cemetery monuments in Victorian Dublin in the 1860s. From Dublin, the revival spread to the rest of the country and beyond. Since the Celtic Revival, the ringed cross became an emblem of Celtic identity, in addition to its more traditional religious symbolism. Modern interest in the symbol increased because of Alexander and Euphemia Ritchie. The two worked on the Isle of Iona in Scotland from 1899 to 1940 and popularised use of the Celtic cross in jewelry. Using the Celtic cross in fashion is still popular today. Since its revival in the 1850s, the Celtic cross has been used extensively as grave markers. Straying from medieval usage, when the symbol was typically used for a public monument. The Celtic cross now appears in various retail items. Both the Gaelic Athletic Association and the Northern Ireland national football team have used versions of the Celtic cross in their logos and advertising. The Church in Wales since 1954 have used a flag with a Celtic cross in the centre. ^ Herren, Michael W.; Brown, Shirley Ann (2002). Q6AEINTAE#v=onepage&q=%22Celtic%20cross%22%20origin&f=false Christ in Celtic Christianity: Britain and Ireland from the Fifth to the Tenth Century Check |url= value (help). Boydell Press. pp. 193–195. ISBN 0851158897. ^ Herren, Michael W.; Brown, Shirley Ann (2002). Christ in Celtic Christianity: Britain and Ireland from the Fifth to the Tenth Century. Boydell Press. p. 199. ISBN 0851158897. ^ Herren, Michael W.; Brown, Shirley Ann (2002). Christ in Celtic Christianity: Britain and Ireland from the Fifth to the Tenth Century. Boydell Press. pp. 199–200. ISBN 0851158897. Werner, Martin (1990). "On the Origins of the Form of the Irish High Cross". Gresta. Gesta, Vol. 29, No. 1. 29 (1): 98–110. JSTOR 767104. H. Richardson: An introduction to Irish high crosses. 1990, ISBN 0-85342-941-3. J. Romilly Allen: Early Christian symbolism in Great Britain and Ireland before the thirteenth century. Whiting, London 1887. Neuauflage als The High Crosses of Ireland. Felinfach: Llanerch 1992, ISBN 0-7661-9262-8. Peter Harbison: The high crosses of Ireland. Habelt, Bonn, 3 Baende, 1991. Wikimedia Commons has media related to Celtic crosses. David Dimbleby. "Age of Conquest". Seven Ages of Britain. 29:16 minutes in. BBC 1.